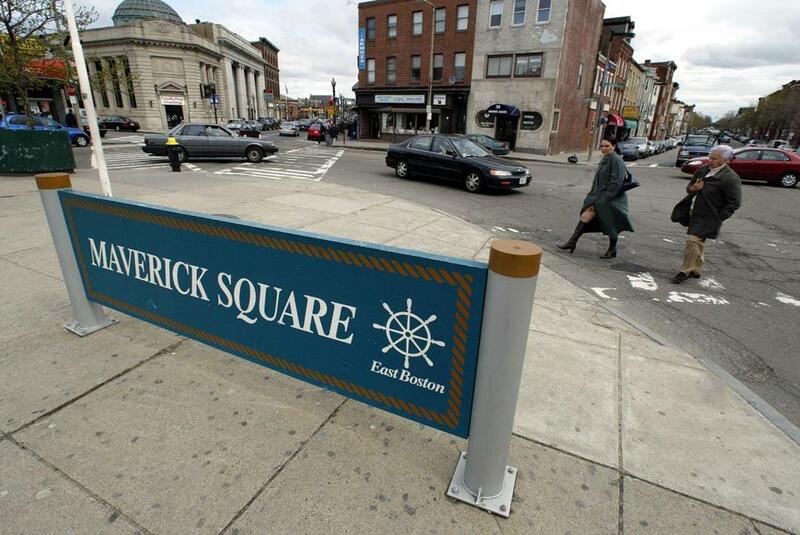 Maverick Square could play host to a proposed recreation marijuana shop, one of two prospective stores in East Boston. Five companies hoping to open recreational marijuana stores in Boston signed contracts with the city on Friday, officials said, most likely clearing the way for them to begin sales to adults later this year. The firms — Bloom and Berkshire Roots in East Boston, Core Empowerment in Jamaica Plain, MedMen in the Fenway, and Pure Oasis in Dorchester — are expected to receive final local approval at a March 12 meeting of the Boston Zoning Board of Appeal. They then would need to win state marijuana licenses from the Cannabis Control Commission and renovate their retail spaces, which could take months and involve multiple inspections for compliance with the state’s long list of regulations for marijuana businesses. The office of Mayor Martin J. Walsh has now executed nine so-called “host community agreements” with proposed cannabis businesses, mostly retailers, in neighborhoods across Boston. The deals are a requirement for operators to win a state license and typically spell out how much money the shops will pay the city, their business hours, and other conditions of operation. “These new host community agreements represent the city’s commitment to ensuring the cannabis industry in Boston brings opportunity to all communities, and continues the administration’s focus on creating a more equitable Boston,” city spokeswoman Samantha Ormsby said in a statement on Sunday. Three of the new contracts awarded by Walsh went to firms whose ownership teams include minorities and local residents, an apparent response to months of sustained criticism by advocates, city councilors, and small-business owners that Boston’s process for selecting marijuana operators is opaque, subjective, and tilted toward larger players. State laws and regulations call for minority and low-income communities that were disproportionately affected by the war on drugs to be included in the newly legal cannabis industry, and Walsh pledged in a December op-ed to make equity and local residency stronger considerations in future marijuana licensing decisions. Host community agreements are handled by the city’s Office of Emerging Industries, whose director, Alexis Finneran Tkachuk, is also its only employee. The City Council is considering legislation drafted by Councilor Kim Janey that would revamp the process by creating a five-person board to oversee local cannabis licensing and giving strong priority to companies whose owners were affected by the war on drugs. During an initial discussion Wednesday, no councilors spoke against the ordinance, and Walsh’s office had suggested in a statement beforehand that the mayor was open to the idea. One of the newly approved stores, Bloom, would be at 71 Maverick Square in East Boston. The company is owned by four men, two of whom are Latino; one of those is a veteran who served in Afghanistan. At a Jan. 31 community meeting on Bloom’s proposed store, neighbors expressed concerns about people reselling its products to minors. But the owners said they live in the area and would make sure their cameras and security system deter such crimes. “There’s nobody I represent who’s more local than these guys,” the firm’s lawyer, Jim Smith, said at the meeting. Berkshire Roots, of Pittsfield, signed a contract for a store a half-mile away in East Boston, at 251 Meridian St. Its attorney did not respond to a request for comment. In Dorchester, Pure Oasis’s proposed shop at 430 Blue Hill Ave. could be the first in the state operated by a so-called economic empowerment company — a designation for firms that are led by, employ, or benefit communities that have had high rates of arrests for drug crimes. Several other such companies have applied to the state, but none have moved forward in the licensing process, probably because they have yet to obtain host community agreements or have other deficiencies in their applications. Kobie Evans, founder of Pure Oasis, hopes to open his store later this year. Getting an agreement from Boston should give the company leverage to raise the several hundred thousand dollars needed to build out the shop, he said. “It’s been a two-year journey,” he said, “and now we’re through the hardest piece of the whole application process. It’s definitely a golden ticket.” Pure Oasis also plans a business accelerator for entrepreneurs from disenfranchised communities, he said. Core Empowerment in Jamaica Plain has a similar community focus. Co-owned by Tomas Gonzalez, who until recently was deputy director of Walsh’s Office of Neighborhood Services, it plans a social justice museum and education center alongside a marijuana store at 401 Centre St. Gonzalez did not immediately respond to a message seeking comment. The final operator to win a city contract, MedMen, plans a store at 120 Brookline Ave. in the Fenway. The national chain was recently hit with lawsuits alleging it defrauded investors, underpaid employees, and fostered an abusive corporate culture of racism and sexism. City officials said MedMen’s local operation pledged 30 percent of employees would be “diverse.” It’s also donating $1 million and 0.5 percent of gross revenue to a new nonprofit that will conduct workforce development and training for the disenfranchised. Naomi Martin and Felicia Gans of the Globe staff contributed to this report. Dan Adams can be reached at daniel.adams@globe.com.